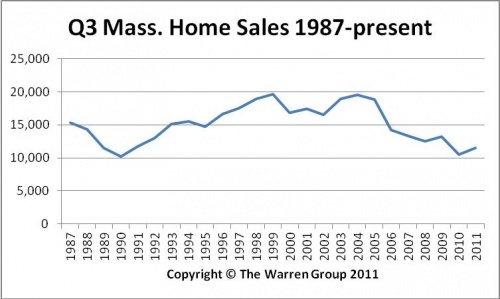 BOSTON, October 25, 2011 – Massachusetts single-family homes sales increased again in September – the third consecutive month sales rose compared to the same month last year, according to the latest report by The Warren Group, publisher of Banker & Tradesman. A total of 3,482 single-family homes sold in Massachusetts in September, a near 7 percent increase from 3,267 sales in September 2010. Sales also increased about 10 percent in the third quarter – rising to 11,539 from 10,509 during the same period in 2010. Year-to-date sales remain down 10 percent at 28,588, compared to 31,831 during the same period a year ago. The median price of single-family homes remained steady at $289,950, a 0.50 percent increase from $288,500 a year earlier. This is the first time since April that the median price statewide dropped below $300,000. Third quarter median prices almost held stable – dropping just 1.6 percent to $305,000. The median price for homes sold January through August was $295,000, down 1.3 percent from $299,000 in the prior year. In September, condominium sales statewide declined 2.6 percent to 1,294, down from 1,328 a year ago. Condo sales in the third quarter increased by less than 1 percent to 4,465 compared to 4,431 during the third quarter 2010. Year-to-date condo sales are down more than 20 percent, dropping to 11,308 from 14,158 during the same period last year. The median condo price increased almost 5 percent in September to $275,450, up from $262,425 a year earlier. Third quarter median prices are up close to 10 percent, increasing to $290,000 from $265,000 in the prior year. The year-to-date median price of condos in the Bay State is $276,500, up more than 4 percent from $265,000 a year ago.